Credit: Betsy McCully. 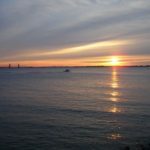 Jamaica Bay viewed from Manhattan Beach, Brooklyn, at sunrise in winter. Marine Park Bridge in background. 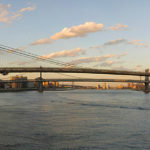 NewYorkNature.us is your portal to the nature and natural history of the New York region. I created this website to inform, educate, and hopefully inspire you about the incredibly rich and diverse natural world of the New York region, past and present. Did you know that New York City was built on an archipelago, a constellation of islands in a vast estuary? 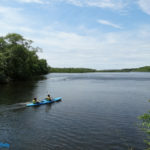 Here in one of the largest cities in the world, you can find wetlands, grasslands, forests, rivers, ponds, lakes, and miles and miles of beaches, dunes, and barrier islands. And all of this is surrounded by the waters of the Atlantic Ocean. This mosaic of habitats has long supported a rich diversity of life. 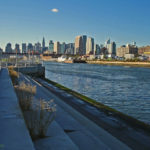 You may be surprised to learn that the site of New York City is a geological hotspot, located at the eastern edge of North America where continents fused and rifted apart. In these pages you can read about the region’s billion-year-old geological history as told in its rocks, the evolution of its flora and fauna as told in its fossils, the advances and retreats of multiple glaciers, and radical changes in the landscape. You can discover how New York’s modern habitats evolved through natural processes, how they became degraded by human activities, and how they are being restored by human efforts. You can find natural histories and photo galleries of New York’s flora and fauna. For those of you who want to learn more, I have provided topical reading lists and useful links. I plan to update this site on a regular basis, so check back to see what’s new. Meantime, come on in and look around, build your knowledge of New York’s nature, and if you are in the city, go outside and explore! Credit: Betsy McCully. Newtown Creek nature Walk steps with view of Manhattan, 2007.
Credit: Ben Cooper. 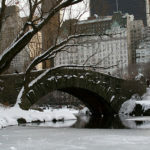 Central Park, Gapstow bridge and skyline in winter. Credit: Betsy McCully. 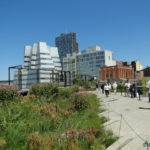 High Line, Chelsea, Manhattan, 2014.